Price: $1,265.00 Group discounts available. Call 1-800-486-5542 for more information. This course is designed for personnel who supervise or must access and work within confined spaces. 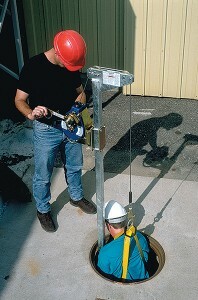 Overview: The focus of this course is confined space entry, egress and rescue training. It is designed for entry supervisors, entrants, & attendants. The course involves both classroom presentations as well as a high degree of hands-on scenarios that will require attendees to actively participate in confined space and rescue applications. The training utilizes pre-engineered rescue systems and techniques that are easily adaptable to both team and peer rescue. It should be noted that this is not a technical rope rescue course. Upon successful completion of this course, the student will receive a certificate acknowledging they have met or exceeded OSHA, ANSI and CSA requirements. Understanding legislative and operational requirements. Understanding how to identify typical hazards and associated risks. Understanding how to assess and control hazards. Understanding how to implement isolation strategies. Understanding selection and use of equipment for entry and egress. Understanding and implementing ventilation techniques. How to select and use respiratory protection equipment (SCBA). Planning for Confined Space entry. Understanding the roles and procedures for Confined Space work. Understanding basic rescue and emergency response procedures.